Artificial intelligence (AI) technologies are seen important for success of nations. Prime Minister’s office initiated this research on overall view of artificial intelligence and Finnish competence in the area. The report divides AI into ten competence areas. The Finnish AI competences in the fields of research, companies and higher education are analysed and described. Research competence is measured in terms of number and quality of scientific publications. Competences in companies are analyzed with questionnaire of large company base, by comparing the relative share of data-analysis and AI specialists in seven large companies representing different industries and with semi-structured interviews of key-persons in nine companies. The picture of course and curriculum offering of universities and applied universities is based on a query and number of interviews. The Finnish competences on all three sectors are compared to foreign counterparts. 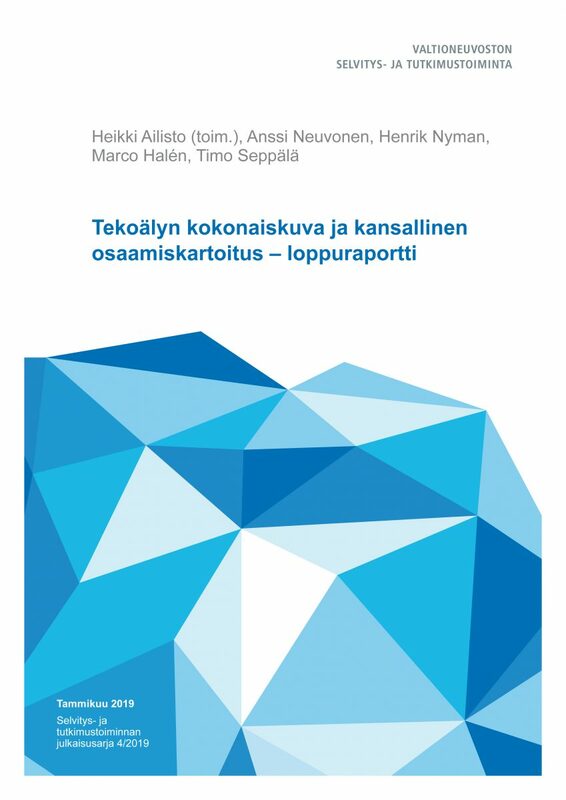 The report identifies Finnish strengths and competence gaps. Policy and action recommendations in order to improve Finnish AI technology ompetences are presented. Publications of the Government’s analysis, assessment and research activities 4/2019.